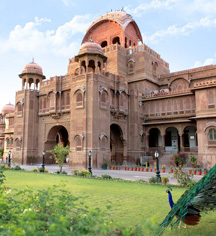 Displaying opulent architectural features, Laxmi Niwas Palace is a magnificent display of the finest structural ingenuity and beauty that celebrates its significance in Bikaner's history and royal heritage. Throughout the grounds, guests will find intricate presentations of stately marble, brilliant sandstone, and detailed fixings that attest to the elaborate artistry and workmanship that created the grand Laxmi Niwas Palace. The Porch - Carved from 46 tons of sandstone, the Laxmi Niwas Palace porch is an impressive porte-cochere bearing an ornate entryway vertically lined with flowering fruit trees, vines, and orchids four-stories high. The Lobby - Adorned with etched glass from Belgium and fragrant arrangements of fresh flowers from the estate's own gardens, the palace lobby is a social hub where guests can enjoy wireless Internet while admiring the hand-painted scenes of pageants. The lobby also displays processions and walls of latticed stone screen, from where the ladies of the court once assessed visiting gentlemen. Rajasthan’s First Elevator - Since 1094, the estate lift has escorted dignitaries and honored guests to and from their resplendent accommodations at Laxmi Niwas Palace. Boasting its charming original buttons and wall-to-wall wooden paneling, the palace elevator was the first in Rajasthan and remains a treasured operating feature of the hotel. The Sunday Painter - As a skilled artist and the palace's security detail, Ram Singh is a man of many talents and an integral part in the diverse culture and refined service of Laxmi Niwas Palace. Singh's has painted numerous portraits with a startling likeness of guests that have witnessed his talents. Singh is also available for group portraits and can work from photographs. The Tour De Turban - A visual identifier of provenance and geographical origin, the safa, or Rajasthani turban, is colorful, multi-hued headdress, tied and worn differently by the region's distinct tribes and communities. Lined around the central courtyard of the palace, wooden cabinets are filled with assorted displays of turbans, reflecting the rich diversity of Rajasthan. 22 Kilometers of Cool - Stretching freely through the entire Lalgarh Palace estate, grand marble foundations weave throughout the palace. Comprised of antique Carrarra stone, the quality of the marble is validated by guests enjoying refreshing barefoot walks on the hottest summer days. The Echo Enclosure - Due to its unique ability to amplify even the faintest of sounds, The Echo Enclosure is a precise space in the palace where the Maharajah once stood to make speeches. Just occupying few meters of invisible space, The Echo Enclosure's enchantment is an anomaly created by the elaborate combination of the palace walls, hallways, and buildings. The Clock Tower - Led by a classic granite driveway, guarded by a sentry at all hours of the day, The Clock Tower is the palace's traditional main entrance and an iconic imprint of the unique structural arrangement and design of the estate. Nightly Entertainment - From Kalbelia dance performances to moving Ghazal poetry recitation, and jugglers and acrobats to folk singers, captivating entertainment is presented every evening in the palace courtyard, lending a lively and unique insight to the cultural and historic offerings of the region. Administered by certified estheticians and masseuses, the spa at Laxmi Niwas Palace is a relaxing haven where guests can indulge in a variety of therapeutic treatments and services, including Ayurvedic Kerala massages, Swedish deep tissue treatments, Bamboo Reed massages, and hot stone therapy sessions. Boasting an array of coffee table books, small leather goods, embroidered purses, and slips, the palace gift shop and is an ideal stop to pick up affordable keepsakes and gifts. Most of the gift shop items are hand-crafted and locally produced by the region's finest artisans. Originally the royal smoking room, Rajat Mahal has since been converted into a reading room where original friezes feature angels, raginis, and deities hovering over dramatic scenes of weather, paying homage to the region's intense climate. Displaying over 18 kg (40 lbs) of gold, Rajat Mahal is a thoroughly distinguished venue adorned with Usta artwork, a red and gold-painted ceiling of teak, a marble fireplace with gold enameling, and grey accents. Rajat Mahal is available for large private events and meetings. Once graced by viceroys for their postprandial exercises, the palace swimming pool combines a casual atmosphere with pristine blue water and stately facilities. Comprised of the original 52 shades of imported Italian tile and granite laid over a century ago, the pool enclosure is fitted with canopied seating and deck chairs. Surrounded by ferocious displays of magnificent tiger hides, the billiard room features baize tables below antique light fixtures where guests can test their aim. With an old felt-lined cues holder, chalk, and board games arrangements, the billiards room is reminiscent of a life of leisure during a bygone era. Laxmi Niwas Palace offers a plethora of sporting facilities, including tennis courts, cricket fields, and indoor quads. Guests can borrow equipment from the hotel and sessions with pros and markers may be arranged.